Walking the red carpet at 102.7 KIIS-FM’s Jingle Ball 2013, Miley Cyrus bared her midriff in a black skirt and black suede halter top with a waist wrap detail from the Calvin Klein Collection Resort 2014 Collection designed by Francisco Costa. Jingle Ball is an annual concert that has been produced by KIIS-FM, a Los Angeles based radio station, since 2000. This year, Miley Cyrus managed to create headlines by twerking with Santa Claus on stage. In order not to ruin the Christmas spirit, we won’t show you any photos of her performance. The 21-year-old artist completed her ensemble with a pair of black-and-gold sandals from the Calvin Klein Pre-Fall 2013 collection featuring pony heels and gold-tone embossed metal straps. 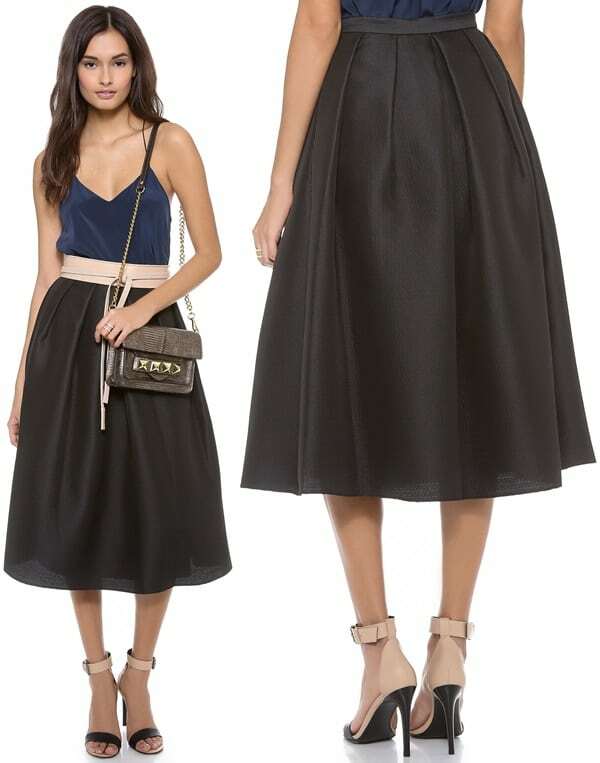 If you’re looking for a long black skirt of your own, perhaps we can tempt you with the following alternatives from Shopbop. According to Time Magazine, Miley Cyrus was the worst dressed celebrity of 2013. However, how do you like the Calvin Klein outfit that she wore at the Jingle Ball?